Gutters help protect your home by collecting rainwater on the roof and routing it to the ground through the downspout. In doing so, gutters prevent water damage to your house. Rainwater will overflow on a clogged gutter and pour over the side of your house resulting to potential damage to windows, doors, siding and foundations. To prevent water damage from a clogged gutter and avoid expensive repairs that could reach thousands of dollars, regularly clean your gutter to keep them debris-free. Wear long-sleeved shirts and heavy work gloves to prevent injury to yourself especially your hands. Sharp objects or metal parts are often lodged inside a clogged gutter. 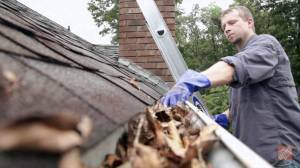 Clean the roof of leaves and other debris before working on the gutter so that next time it rains, these potential clogging materials do not wash into the gutter, effectively doubling your work. Use a handy garden trowel to scoop out debris, dirt and leaves in the gutter. Start working at the drain outlet on the lowest portion of the gutter. The debris is easier to remove when it is damp and not dried or encrusted. Dump the debris on a bucket or plastic tarp to spare your lawn from dirt and avoid cleaning up later. After scooping out the dirt, wash the gutter using a garden hose. Clean the entire length of the gutter, this time working towards the drain outlet. Check the elbow of the gutter or curved portion of the downspout to make sure there are no clogs. For hard-to-remove encrusted dirt, you can use a stiff brush to scrub it off. If water still does not freely flow down the downspout and drain pipe, flush water down using a hose. For persistent dirt, use a plumber’s snake to remove the debris. Clean your gutter at least once a year. A better option is to clean it twice a year preferably in spring and autumn. 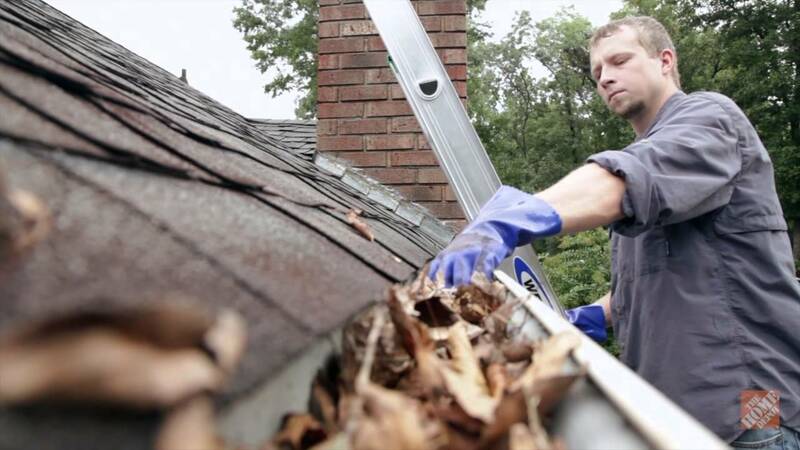 If you have overhanging trees near your roof, twice a year gutter cleaning is recommended. You should also clean your gutter after the occurrence of big storms. Dirt, leaves and other debris could have been blown into your gutter by the strong winds.